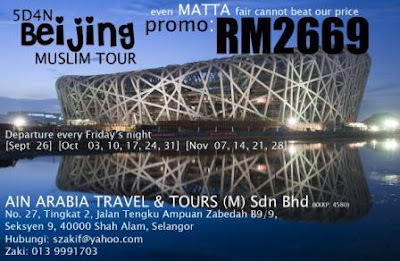 apa yang aku fikirkan...: Jom pi Beijing! Name it: Visa, Accommodation, Visits, Transportation and of course two-way Flight. Mind you, it's Malaysia Airline System (MAS)! Most importantly, it's a Muslim Tour package, so you don't have to worry about the foods and the prays. Contact me Zaki 013 9991703 for further information. wa.. da jadi agent eh.bgs2. i want muslim package to japan n korea! got any??? TQ.. ko kat sane pun cari2 la bisnes yang ade..
what do you mean you got paid? may i know? korea!!! me got that. i'll tell you that ok~ wait wait.. series????!!!!!!! auwww!!! tell me!! tell me more! !